The Cor Capital Fund. Absolute Returns. Established in 2012, Cor Capital is an investment management firm based in Melbourne, Australia. It is the manager of the Cor Capital Fund, an Australian registered managed investment scheme that seeks to generate stable positive returns, regardless of prevailing economic or financial market conditions. The objective of the Fund is to generate medium to long term returns, without significant interim drawdowns, by investing and trading in developed-market equities, precious metals, fixed interest and cash. The Fund portfolio is highly liquid and diversified. It is commonly used as an alternative asset within a broader strategic asset allocation or as a standalone medium-term absolute return investment. “Asset class returns, in our opinion, are largely driven by changes in expectations of economic growth and inflation. That said, economic and market outcomes are uncertain; changes to expectations are unpredictable for practical investment purposes. Surprises are common and have an underappreciated influence on long-term asset class returns. However economic and market outcomes are not arbitrary; while very different in nature and critically consequential to investor wealth, the range of possible scenarios is limited. 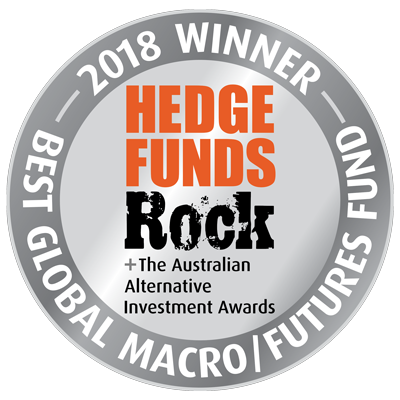 © 2018 Hedge Funds Rock and the Australian Alternative Investment Awards. All rights reserved.